Vera Nestorova is a founder and chairperson of the Board. She is the main instructor of APORT BG as well. 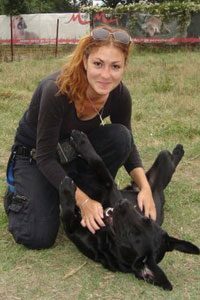 Vera is professionally engaged with dogs from 2006, she is a certified guide dogs mobility instructor. She has an extensive experience with guide dogs – the most difficult dogs’ profession, with therapy and service dogs as well. Vera has took part in various international trainings and projects, and she constantly strives to enrich the background with new knowledge and useful practices.